Though he bears the Marley surname and has been heavily influenced by his father, Jo Mersa does not walk in the shadows of his musical lineage – he walks beside it, guided by it – as he molds his own path in the music industry. Two hours before he was set to take the stage at Chicago’s Bottom Lounge, I sat face-to-face with Jo Mersa Marley. For nearly an hour we spoke candidly, not just about his childhood, family, and career, but mine as well; the young Marley interviewed me just as much as I interviewed him, always looking at me eye-to-eye. And at only 25 years old, he is wise beyond his years – something he has inherited from his father, who inherited it from his parents. Marley is currently on tour with Jemere Morgan and J Boog, and preparing to release his debut LP, Guess Who’s Coming Home – the follow-up to his 2014 EP Comfortable – later this year. For Marley, the album’s title is more than just the title track. He also attributes the name of his album to a displaying of his roots, musically and personally. “Guess Who’s Coming Home is part of me trying to remind us of where we come from and not lose sight of that,” he says, smiling. For Marley, Guess Who’s Coming Home is a bringing together of cultures and genres, a mix of roots reggae, dancehall and hip hop – all of which originated in Africa. “In more than one way, I am coming home,” he adds. Growing up in a musical family, Marley has always had an appreciation for all genres of music and states that he has been inspired by the legends – the likes of Stevie Wonder, Shabba Ranks, Peter Tosh, Aretha Franklin, Michael Jackson – the list is endless. Jo Mersa notes that the Marley family is one of musical historians, and because of this, he has a love for all music – including country. “Country music writers are some of the best writers,” he says as we discuss the inspiration and interpretation of lyrics in general. Marley began writing music at a young age, and while he doesn’t remember all of his early songs, he remembers what he was experiencing at the time, as those experiences became the inspiration behind his music. During our conversation, Marley reminisced on his childhood, growing up in both Florida and Jamaica, traveling with The Melody Makers as a young child, and even educating his peers on the legends of music. Because so many artists and genres have influenced him, Marley is firm on acknowledging and paying homage to those that came before him – so much so that he is selective about who he walks into the Lion’s Den with. He told me a story of how, as a teenager, his classmates would want to make music with him, yet they were wilfully ignorant of their musical roots. Watching Jo Mersa onstage, he undoubtedly brings the Marley energy and good vibes – like his grandfather, father, and uncles. Backed by a live band, Jo Mersa paid homage to his grandfather, the late Bob Marley, with “Three Little Birds”, “Could You Be Loved”, and “One Love”. He also performed several originals, including “Sunshine” (an ode to his one-year-old daughter) and “Private Beach Party”. Some of his favorite moments on the stage have come alongside his father and his uncles. Outside of his music, Jo Mersa Marley spends a lot of time working with Ghetto Youths International (GYI) – a record label and charitable organization established by his father and uncles. Its purpose is to assist and educate underprivileged and minority children and adolescents both in the U.S. and Jamaica. When asked about how GYI has influenced not only his music, but his life, he sits quietly for a few seconds before responding. 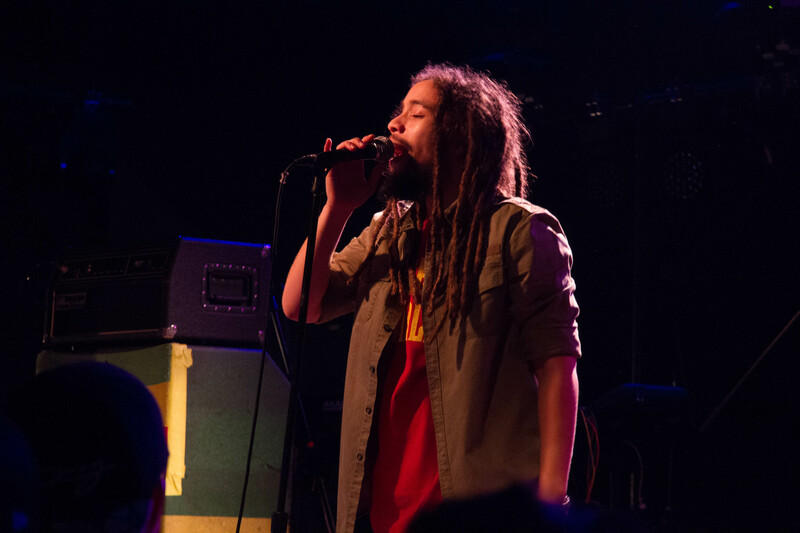 Jo Mersa Marley is as insightful and wise as he is musically gifted, and seeing how his family has influenced and touched so many lives – not only through their music, but through their actions – is something he is proud of and intends to continue.